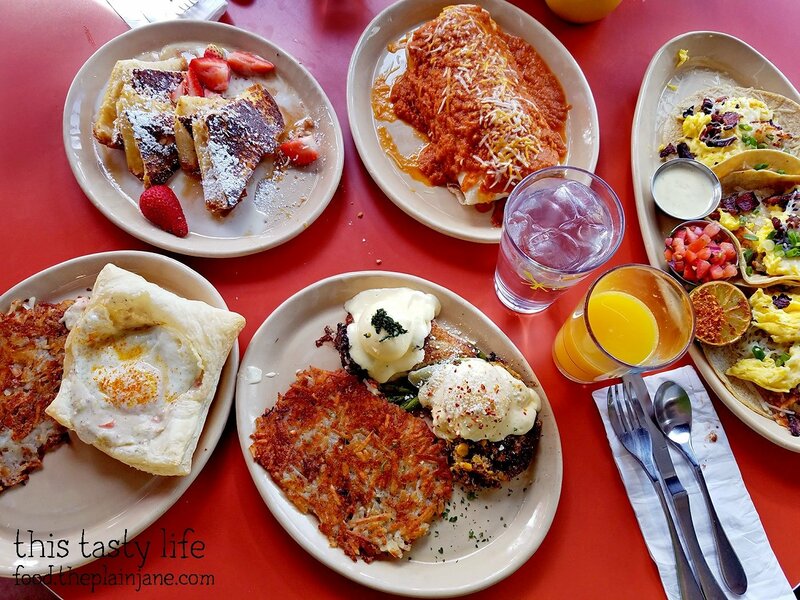 Over the weekend I was invited back to visit Snooze AM Eatery. 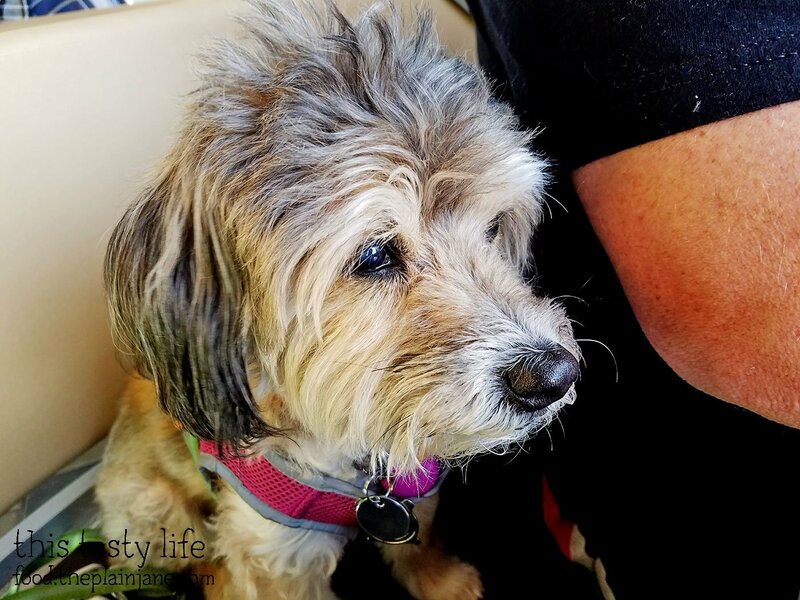 Like I could turn it down – Snooze is awesome! I was looking forward to a nice breakfast out on the patio at their newest location in La Jolla (by UCSD in the Whole Foods parking lot). Jake and Jake’s mom joined us for breakfast along with little Maya. She was actually relaxed and chill this time since I gave her some doggy anti-anxiety meds. She looks a little zoned out. Ha. We started off with drinks. Jake got this hot chocolate with a massive amount of fresh whipped cream on top. Not too sweet and quite delicious. I had an orange juice and Jake’s mom had some mint tea that smelled wonderful. 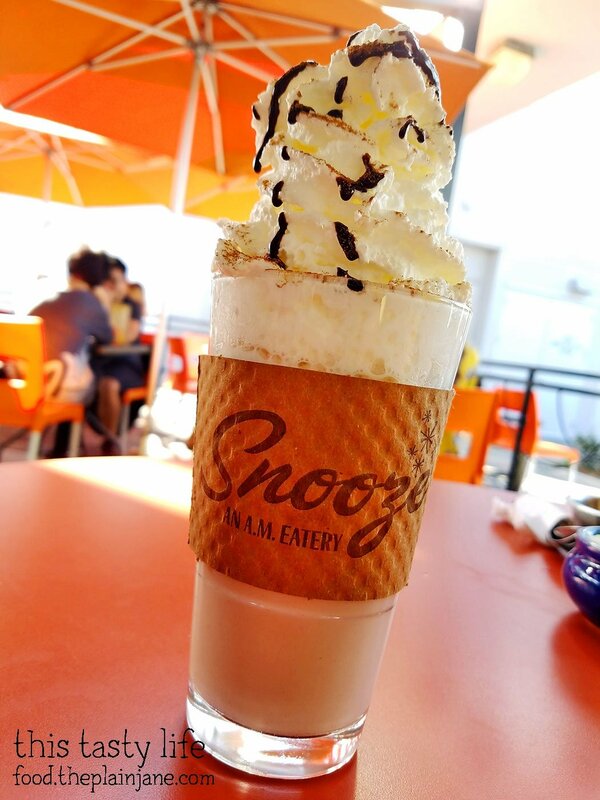 One of Snooze’s latest creations is Nana’s Hot Cocoa Pancakes. 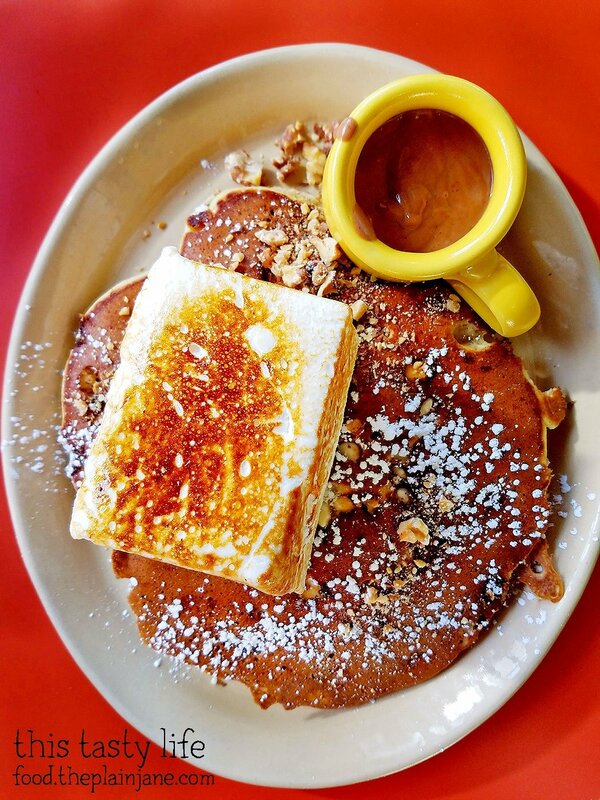 It is banana buttermilk pancakes filled with banana chunks and white chocolate chips topped with a homemade toasted marshmallow, toasted walnuts, and a side of Mexican hot chocolate sauce. Here’s how it looks after I dumped the sauce on. The sauce was a little too thick to pour nicely, but that’s okay. Now… I am not a marshmallow person. S’mores are fine since it’s melted. So while the marshmallow looked stunning, it personally doesn’t do much for me flavor wise. I actually really liked the pancake on its own without the extra sauce or marshmallow. The banana buttermilk pancakes on their own were outstanding! It tasted like eating banana bread but in pancake form. 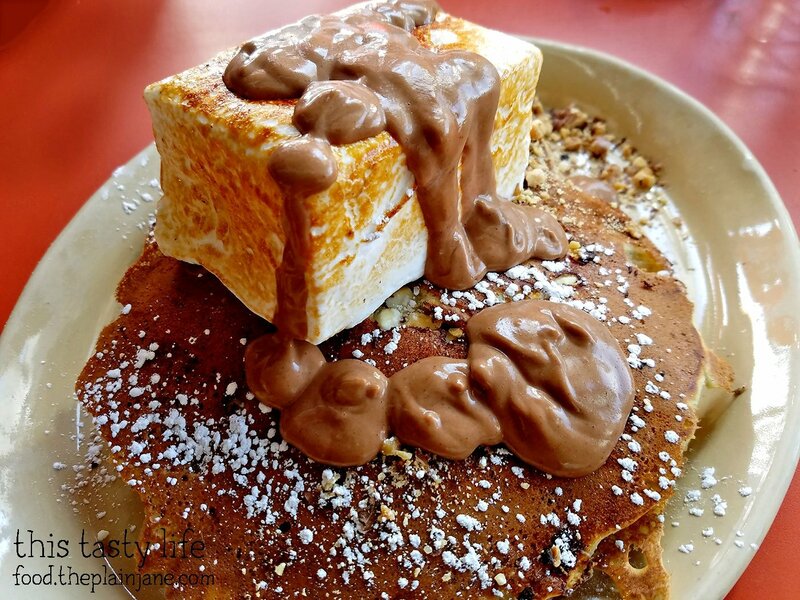 The pancakes were tender and sweet without the extra sauce and marshmallow. Maybe I’m a heathen but I’d rather have this plain! For my personally chosen breakfast, I went with a pair of eggs benedicts. On the left is “I like you E’Lote Benedict” which is an elote corn quinoa cake on the topped topped with a poached egg and chili lime hollandaise with cotija. I enjoyed the corn flavor of this and I’m always surprised I actually like poached eggs. Poached eggs are the only runny eggs that I enjoy. I’m a weirdo. On the right is the Steak + Eggs Benny which was my favorite of the two. It’s got seared hangar steak underneath all of that luciscious smoked cheddar hollandaise along with poblano cheddar grits cakes and some asparagus. The grit cakes were devine and the steak was so tender and cooked just right. 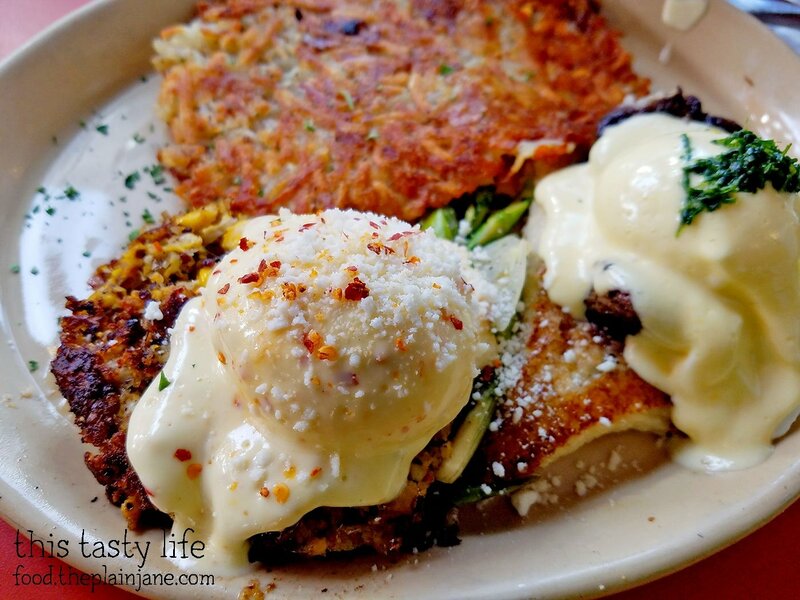 The hollandaise was also to die for – yum yum! Jake went with a favorite dish of ours, the Breakfast Pot Pie with a over easy egg (since he didn’t have to share with me – ha). Their rosemary sausage gravy should be put on everything because it is killlllllllller. 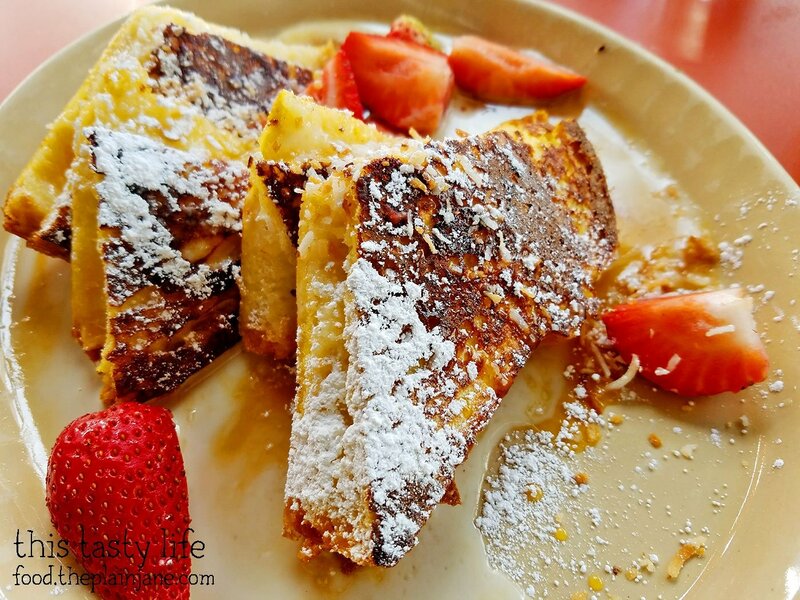 Another shared dish we had was the OMG French Toast. We had this last time thanks to a recommendation from the manager in Del Mar, who is coincidentally currently the manager in La Jolla until he runs away to help open more Snooze locations in Texas! I only had a couple of bites of the french toast but I totally finished off the leftovers last night – this really is one of the best french toasts I’ve ever had. The light, fluffy brioche bread is stuffed with mascarpone cheese (sweet! light! delightful!) and then grilled and topped with vanilla creme sauce, some salted caramel, strawberries, and toasted coconut. Amazingly it is not cloying in it’s sweetness – the sweetness is more subtle and allows you to enjoy the flavors without feeling like you’re gonna go into sugar shock. I appreciate this. I love it. Jake’s mom got Juan’s Breakfast Tacos for her meal with a few things on the side so she could arrange it how she likes it. It’s a hearty meal for breakfast and can really fill you up! 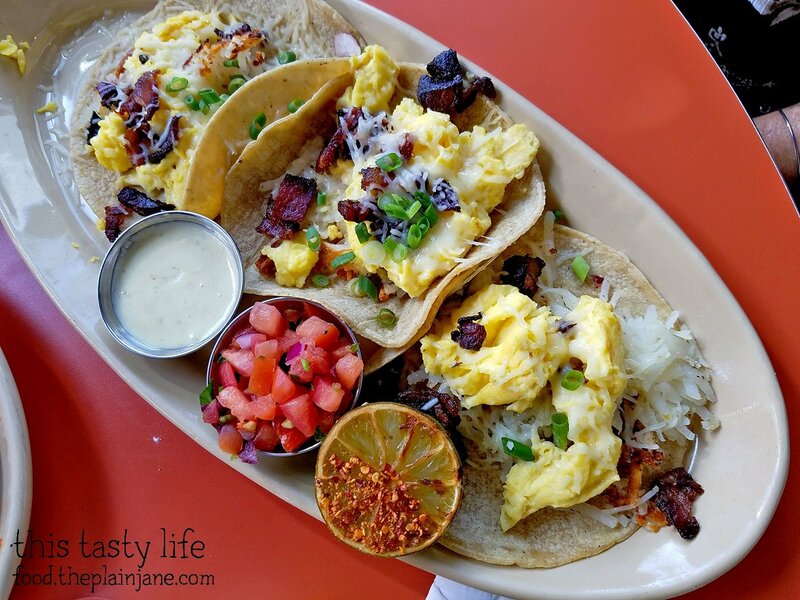 The tacos are stuffed with scrambled eggs, hash browns, and jack cheese (and I spy some bacon on there, too). Yum yum! 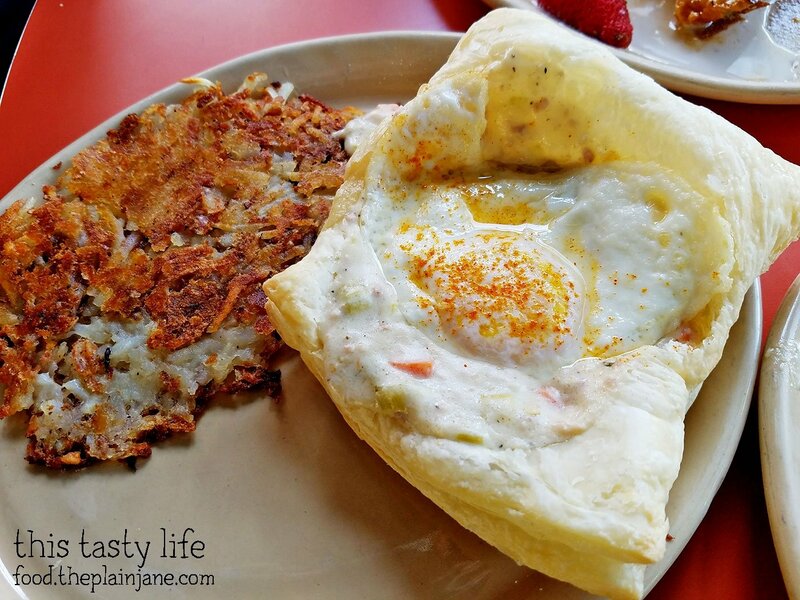 Snooze really does a great breakfast (and lunch!) and their food has always been spot on. If you haven’t been I recommend trying them out for breakfast some time! Pro-tip, if you don’t want to wait as long you should go EARLY – or after the lunch rush. Disclaimer: I was invited to dine at Snooze. Our meal was complimentary. I was not paid further and all opinions stated here are my own.